Tirunelveli: The committees set up by the Centre and Tamil Nadu Government to resolve the standoff over the Koodankulam Nuclear Power Plant met here on Tuesday for the first time when representatives of the protesters presented a charter of demands including a paper on plant’s status. Emerging from the hour-long first round of talks held at the Collectorate here between the 15-member experts committee set up by the centre and six-member state panel, two members of the movement described the talks as satisfactory. They said talks could not be started without any document and demanded that they be given the reports besides replies to their questionnaire. 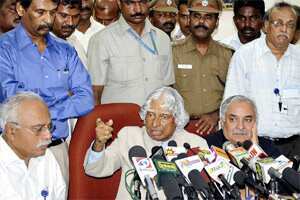 They demanded a white paper saying officials were creating a scare among the people by stating that continued halt of the work would affect the plant while former president A P J Abdul Kalam after his visit to KNPP vouched for its safety. Contradictory opinions were being expressed by the experts about the safety of the plant. “It is the Government’s duty to clarify all this... Our immediate request is that some sort of fear is in the minds of the people and it should be cleared," Pushparayan said. The talks were held two days after the visit of Kalam when he suggested a ₹ 200 crore 10-point action plan for the development of the area and asked officials to allay the fears of the people, who are demanding scrapping of the project. The centre set up the panel after a delegation of the anti-KNPP movement leaders met Prime Minister Manmohan Singh in New Delhi in October.